CCN is a community based newsletter reporting and commentating on a variety of issues of potential interest to its readers. To this end we have appointed the ubiquitous Man-on-the-Mussalaah, the mercurial Madame Mumbai, BrizzieBoekwurm and the not-so-subtle Felicia Mabuza-Blunt (she who, when requesting for black pepper on an SAA flight recently, was given a copy of the Sowetan) onto our payroll - which, if truth be told, amounts to little more than a packet of Tennis biscuits and a few cups of Rooibos each week. Armed with some very tenuous CCN credentials this intrepid team of embedded reporters can often be seen probing the length and breadth of Brisbane's southside for news items and events pertinent to our readers. But they cannot hope to cover every nook, cranny or mimbar. So this is where you come in, dear reader. CCN can only be as informative as the news that you are prepared to supply it with. A regular feature of every issue has been the call to drop us a note if you would like something published or reported on. Much of the local content news that has been appearing in these issues is from leads and copy kindly sent in by our subscribers and through the efforts of the CCN team which, despite their best intentions, will be found wanting on occasions. CCN is as much your newsletter as its anyone else's. Please feel at liberty to use it as such. A recent migrant from the UK is having difficulty in finding a job in the IT field despite several efforts on his part. He is desperate to become employed and is willing to consider other short or long term alternatives. If there is anyone in our community able to assist him or even to tide him over this period he would be most grateful. Please contact your theteam@crescentsofbrisbane.org to put you in touch with him. This is a real opportunity for our community to come to the assistance of one of its own. From 24 March to 1 April there will be a book exhibition at the Darra Mosque between 11am and 8pm daily. You will find books on various topics including Aqeedah, Dawah, Fiqh, Comparative Religion, Islamic History, Biography, Quraan Tafseer, Hadeeth, Manhaj, Fataawa, Arabic Language, Contemporary Issues, Women, Family, Taqwa, Economics, Finance, Medicine, Children’s Stories,Colouring Books, Muslims in the West and more. Books by renowned scholars like Sheikh Ibn Tayyimah, ibn Qudamah, ibn Qayyim, Yusuf Qardawi, Bin Baaz, Uthaimeeen, Maududi, Banna, Qutb, Wahidun Khan, Khurram Murad, Jamaal Badawi, Abu Ameenah, Harun Yahy, Mubarakpuri and many more will be on sale. For further information email alasad78@yahoo.com or phone 07 38797349. Lecture series by Prof. Sharfi at Darul Uloom start today between 7.30 and 9.30 pm. Details can be found in CCN0021. Our Man-on-the-Mussalaah has learnt that the good Professor will also be speaking at the Kuraby Masjid on 6, 7 and 8 April after Eshah. Mother of Anver Omar, Hawwa Omar, has arrived from South Africa to settle here in Brisbane. Recently arrived to settle in Brisbane after living for some 22 years in Tasmania are Osman and Rashida Khan (ex-Durbanites) with their children, Ziyaad and Zahir. Rashida is a GP and Osman is an engineer. Zubair Khatree (son of Yusuf and Sabera Khatree) and his wife Raeesa arrived in Brisbane for a short stay. We hope to see them on a more permanent basis in Brisbane soon. Zubair has a degree in Business and Raeesa is a lawyer. CCN and Crescents of Brisbane welcomes the new arrivals and trust that their stay here will be a pleasant and happy one, inshaAllah. Looking for a set of good quality pots? Why not contact Saeeda Vorajee (Omarjee) on 3219 0134 or 0411232448 for a demonstration of the NMC Exquisite waterless cookware range which Saeeda says is designed to complement the culinary skills of the most discerning chef. "Made in South Africa to the same standards of the AMC variety but a whole lot cheaper, these pots are built to last a lifetime and their timeless elegance is guaranteed", she told a CCN reporter. If you would like CCN to promote your business as well, why not send the details to your theteam@crescentsofbrisbane.org. You could almost literally smell the braaivleis and the biltong at the Pieter-Dirk Uys shows at the Powerhouse this week where he was greeted on each of the three nights by packed houses of more white ex-South Africans than you could shake a stick at (to use an Australianism whose actual meaning will forever remain a mystery). And the Crescents Community too was also well-represented cringing occasionally at references to Oriental Plaza, Indians passing themselves off as Italians (? ), and Muslims "turning Sandton City Shopping Plaza into Mecca every midday". But from PW Botha through to Thabo (whose name we learned coincidentally and ironically turns out to be an anagram of Botha) no one who was anyone in the pre- and post-apartheid political landscape was spared. It will be hard in future to watch the Tutu ads on TV where he plugs Griffith University without getting hilarious flash backs of Uys pulling down the purple gown and doing an uncanny impersonation of the good man. Uys' on-stage transformation and his facial and vocal expressions were so on the mark that he had little need for black polish to make his duskier characters any more believable. However, if there was one cause for criticism then it must surely be in his blatant omission of the Teflon-coated Rajbansi and his ex-wife Asha Devi - she of the atrocious hair-do, makeup and dress, and the one person one would have thought deserved to stand alongside the Jewish suburban housewife in the "sitting duck" stakes. Underlying all the parody, humour and colourful characterizations were less than subtle messages of the enormity of the Aids problem in South Africa and the ostrich-like mentality of the present government not only in this regard but in it's support of the Mugabe regime. But the part that Australians played in the demise of its Aboriginal peoples and the role of the fourth-term Howard government as lackeys in the Iraq war also got enough jibes that would have cut through any 'holier-than-thou' attitude on the part of any Australians present like knife through butter. For those of us who lived alongside the characters he portrayed, the night helped revive many memories of the earlier days of apartheid that time and distance were fast beginning to erode. Occasional exposure to such shows serve as a permanent reminder of the bad old days "Lest We Forget". In just about seven weeks time you and your family will be taking part in your second CresWalk2005 Fun Walk and Run. If you haven't begun some gentle training for the big day then now is a good time to make a start by taking yourself and your family down to Kangaroo Point on Sundays at 7.30am to get you into the spirit of the occasion. Last Sunday we welcomed the Mahomedy family and one Mustafa Kemal Omar as our latest CresFit4Life-ers. DATE CLAIMER: On Sunday 10 April there will be a breakfast after the walk. Mark this morning off on your calendar and come along with your picnic basket and your family and enjoy the sights and sounds of the Brisbane River with us. "On behalf of the Islamic Women’s Association of Queensland (IWAQ), we would like to thank all stall holders, sponsors, donors and volunteers for your enthusiasm and willingness to support our endeavours for our Harmony day event, Behind The Veil Expo - Underneath We Are The Same, last week. We would like to personally acknowledge your contributions to making the day a success and such a memorable event. Once again we thank you for taking the time to be a part of the event". Bring with you a letter from your Motor Vehicle Insurance Brokers certifying that you have a no claim bonus, or better still, a letter certifying that you have not had any accidents and claims in the last 8 years. THAT WILL ONLY APPLY IF YOU HAVEN’T HAD ANY CLAIMS. Bring with you a letter from your Home Insurance Brokers certifying that you have a House Owners policy and a Householders policy with them and that you have not had any claims with them for however many years. AGAIN, THIS WILL ONLY APPLY IF YOU HAVEN’T MADE ANY CLAIMS. The above two will assist you when you are taking out insurance for either a car or home in that your premiums will be almost half of what you would usually have to pay. Bring with you a letter from the AA certifying that you have been a member with them for however many years you’ve been with them. This will assist you if you decide to become a member of the RACQ. Your premium will be lower and you will get a higher-class membership. We have found RACQ to be very helpful in the event of breakdowns. Therefore we suggest that you become an RACQ member. 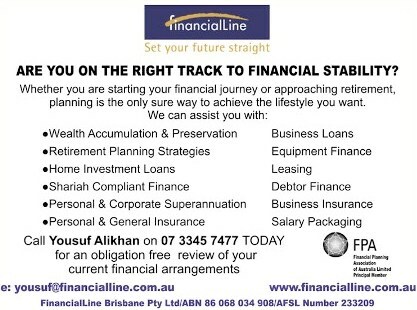 If you have an questions on this aspect of the advice please e-mail your CCN theteam@crescentsofbrisbane.org. After stopping for a drink at a bar, a Zimbabwean bus driver found that the 20 mental patients he was supposed to be transporting from Harare to Bulawayo had escaped. Not wanting to admit his incompetence, the driver went to a nearby bus stop and offered everyone waiting there a free ride. He then delivered the passengers to the mental hospital, telling the staff that the patients were very excitable and prone to bizarre fantasies. Congratulations to Naeem Khatree (Hanief and Abeda) and REMOVED ON REQUEST (REMOVED ON REQUEST) on graduating with a Bachelor of Business (Accounting) from the Queensland University of Technology (QUT). Naeem is serving his articles with a firm of accountants. REMOVED ON REQUEST. While you are languishing at some Gold Coast Resort during the Easter break I reckon you could do a lot worse than get hold of a copy of a book that I am currently reading. 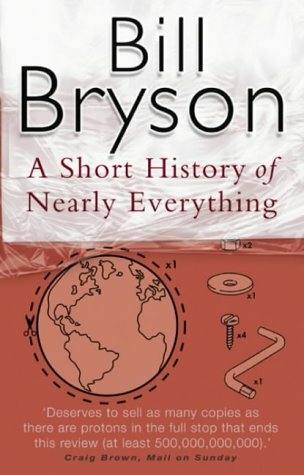 It's Bill Bryson's A Short History of Nearly Everything in which he tries to help people appreciate how we have used science to understand the smallest particles and the unimaginably vast expanses of space. He takes subjects like geology, chemistry, paleontology, astronomy, and particle physics and makes them more comprehensible to people who may have been bored (or scared) stiff of science by school. His interest is not simply to discover what we know but to find out how we know it. How do we know what is in the center of the earth, thousands of miles beneath the surface? How can we know the extent and the composition of the universe, or what a black hole is? How can we know where the continents were 600 million years ago? How did anyone ever figure these things out? On his travels through space and time, Bill Bryson encounters some fascinating, eccentric, competitive, and foolish personalities. In their company, he undertakes a sometimes profound, sometimes funny, but clear and entertaining adventure in the realms of human knowledge. Science has never been more involving, and the world we inhabit has never been fuller of wonder and delight. Great material for a book club discussion and for it's philosophical implications. PS. When next you are looking for a gift to give someone back home or someone who is visiting with you in Brisbane, forget rummaging through the bargain basement of the Mikasa store and get them a copy of Bill Bryson's other book "Walkabout" (which is actually two books in one - A Walk in the Woods and Down Under) in which he describes his travels through various parts of Australia including places your visitor is unlikely to see during their stay here. It's a very funny and informative book about the country we live in and decidedly cheaper than a Mikasa salad bowl! We've enjoyed working with CCN thus far and hope the Kids4Kids event will be the start of many more productive and successful events we can work on together insha-Allah. [Editor] COB + IFA = COOL! I would like to personally thank all the individuals who assisted on Saturday 19th March 2005 at the IWAQ Harmony Day event, Behind the veil expo-underneath we are all the same. Without the assistance of such fine and enthusiastic individuals the event would not have been successful. Thank you for taking time of your studies and other duties to assist in this event, it was much appreciated. The individuals to name and in no particular order are: Mariam Essof, Ismail Essof, Ahmed Essof, Riaz Essof, Ziyaad Hassan, Idris Jangda, Muhammed Jangda, Yusra Adams, Ishrar Ali, Afraan Noor, Salma Sabdia, Aarefa Ismail, Mastura, and Shamsa Cassimjee. I would also like to thank Farnaz Cassimjee and her team of dancers for getting together and performing on such short notice. Your time and effort was much appreciated. Once again thank you to all the individuals who assisted in the event and I apologize in advance if I have failed to mention them in this notice. However, please note that your efforts have not been overlooked. [Editor] Our Man-on-the-Mussallah, who was on duty for CCN at the 'unveiling', was deeply touched by the selflessness and dedication of the young volunteers who came to set up as early as 6 in the morning and then stayed to clear up long after everyone had left in the afternoon. [Editor] Used to be a lot more convenient at Garden City for us Southsiders................ but we'd never let a few extra kms come between us and a certain Ms Rai (or in the case of our Madame Mumbai, make that a certain Mr. Khan). The best ideas and the best feedback come from our community of readers. If you have a topic or opinion that you want to write about or want seen covered or any news item that you think might be of benefit to the Crescents Community please e-mail your theteam@crescentsofbrisbane.org. If there is someone you know who would like to subscribe to CCN please encourage them to send an e-mail to your theteam@crescentsofbrisbane.org with the words “Subscribe Me” in the subject line. Articles and opinions appearing in this newsletter do not necessarily reflect the opinions of the Crescents of Brisbane team, CCN, its Editors or its Sponsors.